Sophomore Andrew Forbes of Nashville, Tennessee, used cursive everyday in elementary school, from third grade through eighth grade. He was required to write out all his papers, worksheets, and notes in the flowing line of slanted script. He finds cursive so much faster and easier than printing, he still uses it daily in high school. Forbes might be one of the last holdouts. The decline in teaching cursive handwriting, the rise of the keyboard, and the introduction of the Common Core State Standards that do not require children to know cursive has the New York Times asking, “Is Cursive Dead?” Passionate advocates claim that cursive is a cultural tradition with cognitive and academic benefits that must be preserved, while some teachers and handwriting experts say the decline of cursive is natural, and it should be allowed to morph into a print/cursive hybrid, or bow out altogether. Research suggests a strong connection between handwriting and brain development -- not only in the development of fine motor skills, but also in how children learn. 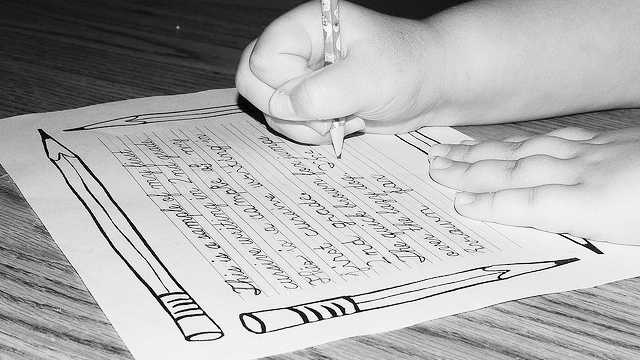 In one study conducted by psychologist and cognitive scientist Karin Harman James at Indiana University, children who printed letters instead of just seeing and saying them showed “adult” brain activity; in another, led by educational psychologist Virginia Berninger at the University of Washington, second, fourth and sixth grade students wrote better sentences, wrote more and faster when using a pen and paper as opposed to a keyboard. "I think there is value in learning a skill that that takes patience, perseverance, and diligence to master." Of course, there is more to cursive handwriting than the time it takes to teach it, or the cognitive benefits of using it. Cursive’s roots are deeply embedded in cultural significance: the Declaration of Independence was written in cursive; there is the overwhelming recognition of finding a letter written in a loved one’s unique handwriting. And beyond the logistical problem of future generations not being able to read cursive, is there a reason to learn cursive for no reason at all, besides doing it for its own sake?